When the British Broadcasting Corporation (BBC), the world's largest news operation, decided in January not to call the Charlie Hebdo attackers terrorists, this made an impression on me. Terrorism is such a loaded word. The UN has been struggling for more than a decade to define the word and they can't. It is very difficult to. We know what political violence is, we know what murder, bombings and shootings are and we describe them. That's much more revealing, we believe, than using a word like terrorist which people will see as value-laden. Not only can the United Nations not define this little word; one study, Political Terrorism, lists 109 definitions for it and debate over its meaning drives specialists to distraction. The concept just involves too many moving parts – personnel, weapons, tactics, networks, and goals. An American security specialist, David Tucker, urges those who would define it instead simply to "abandon hope" like those entering hell. His Israeli counterpart, Boaz Ganor, jokes that "The struggle to define terrorism is sometimes as hard as the struggle against terrorism itself." If the BBC, the UN, and specialists cannot agree on what the word means, neither can politicians or the police. Does it make sense to soldier on fighting a semantic battle that will never be won? Why argue for a word that everyone agrees in confusing and some find loaded? Therefore, I too have stopped using terrorism and terrorist (counterterrorism, however, is a tougher word to drop). It's not worth the fight. Better to use words like violent, murderous, Islamist, and jihadi, words that do not generate a definitional uproar. 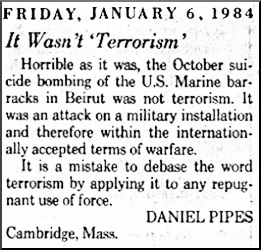 Better not to have to waste time arguing that the U.S. or Israeli governments are not terrorist. Worse, this argument over terrorism diverts attention from the important fact, which is destruction and murder. Rather than have a debate whether an act of violence meets some theoretical threshold, let's focus on the real problems. I have written & spoken some 200 times about terrorism; I argued over decades for its coherent use; note my Washington Post letter to the editor on this topic in 1984; as recently as last October, I co-authored an article arguing that the legal and financial implications of the word terrorism require that it have "a precise and accurate definition, consistently applied." 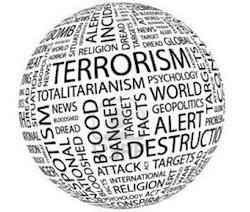 My new view is that legal and financial documents should be re-written without the term terrorism. It's been five months now since these words fell out of my vocabulary, long enough to be able to report that my analyses hold up and my political efforts undimmed. In fact, I am better off unburdened of it and its vocabulary debates. You would be too.